Home > Renko Basics > What are Renko charts and how to trade them? Renko charts are price charts that are independent of time. The Renko charts are said to have originated in Japan and the name Renko is said to be derived from the Japanese word Renga, meaning “brick.” The Renko chart is also known as neri, training or a zig zag chart. Renko charts are widely used in different markets, including stocks, forex and futures. Renko charts are one of the most unique chart types and belong to a set of chart types such as Point and Figure, Kagi and Range Bars, all of which focus purely on price. It is because of this distinctive feature, that traders look to Renko charts are exhibiting pure price trends with little noise relative to candlestick or other time based charts. Here’s a comparison of a Renko chart and the regular Candlestick chart. The next picture below shows how a standard Renko chart looks like. In order to build the Renko chart, the box size or brick size needs to be determined. Traders can use a fixed box size such as 5, 10 or any value of their choice or choose the 14 period ATR value to automatically select a Renko block size. Once the value is determined, the Renko blocks are plotted. When price moves “x” number pips or ticks that the trader has selected, a new Renko block is plotted. You can also read about Renko charts here if you are more advanced and would like to skip the basics of what are Renko charts in this article. A reversal Renko chart is formed when price moves two times the box size. Also the red or the reversal Renko box is plotted in the next column below the previous Renko box. Among the different chart types, Renko charts are similar to Point and Figure charts in terms of the way the charts work and visually, Renko charts are similar to a three line break chart. The next picture below shows a comparison of the Renko chart with a 3-line break chart alongside a point and figure chart to get an idea on the three chart types that function independently of time. The Renko charts are often depicted as bricks, placed on top of or below the precious brick, shifted to the right, this makes Renko charts visually stand out among other chart types. How to construct a Renko chart? The Renko Chart uses closing prices. However, traders can select any price that they want to. In fact most charting platforms such as Tradingview’s Renko charts allow you to choose between OHLC and median prices among other options. However, the widely accepted notion is that a Renko chart uses closing prices, unless specifically mentioned. To construct a Renko chart, the first step is to choose a price unit which becomes your Renko box size, or the renko brick size. When in doubt, you can always use a 14-period ATR to get an automatic value. You can then experiment and fine tune the Renko chart’s box size to your liking. If you would like to learn more, then this article will teach you how to choose the right Renko box size to trade. After you have selected price unit, it becomes the Renko height or the box size. Therefore, if you selected a value of 2, then the two-point Renko chart will have all the Renko boxes that are equal in height with each Renko box 2 points tall. Now that we are armed with the basics, the next step is to look at a table. The number within () shows how many Renko blocks were formed and the ↑and↓ shows if it was a bullish or a bearish Renko box. The chart below shows a brick-by-brick construction of the Renko chart based on the above table. Traditionally, trading with Renko charts was largely confined to using the Renko chart as a trend following tool. This meant, buying on a bullish brick in continuation of the trend, or to wait for a bullish or a bearish Renko reversal box and buying accordingly. The chart below shows the $1.7 Renko box size for Apple Inc. stock. The chart shows how the Renko blocks can still be used as a trend following method to sell and buy into the downtrend and the uptrend. However, since the days Steve Nison first dedicated a chapter to Renko charts, technology has made it possible to combine different technical indicators on the Renko charts. We can now combine a mix of various technical indicators and a combination of drawing tools to trade with Renko charts. What are the drawbacks of trading with Renko charts? Trading with Renko charts requires a lot of patience and contrary to popular opinion, price action methods work a lot better than using technical indicators. However that is not to say that you cannot trade Renko charts with technical indicators. In fact you can see a long list of Renko trading strategies here, based on many different technical indicators. Most traders tend to switch to Renko charts after they haven’t had much success with the more conventional form of trading. Renko charts definitely do not make you rich overnight and neither are Renko charts the holy grail of trading. One of the common traps Renko traders can fall into is paying too much attention to the technical aspect of trading and ignoring the fundamentals. This can be disastrous especially if you are trading stocks and analyzing the stocks based on Renko charts. Therefore a balance needs to be found. For all the drawbacks, Renko charts are probably one of the most interesting chart types that I have found and as someone who has been trading with Renko charts, I really have nothing to complain. 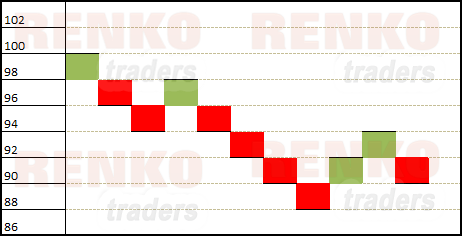 Updated: We have now prepared a simple infographic explaining what is a Renko chart.